HOLA bearings are designed for operation under radial and axial load of wheel live axial and axle; and to decrease friction of different vehicle units. Ball bearings consist of outer and inner race, rolling elements (balls and rollers), separator and sealing according to each bearing type. Production of HOLA bearings uses advanced equipment; bearings are made from high grade bearings steel with using effective grease. Production includes several inspections of quality. 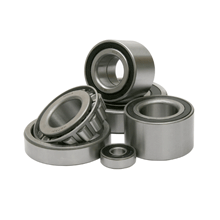 Closed-type HOLA bearings contain grease enough for all service life.